All we need is something cheap to leave the trailer while visiting friends in Vegas. Just passing through. I that case, I think I'd go to the Circus Circus campground, so you're right there on the strip if you have time for it. I've stayed at the hotel but not at the campground itself. We stay at Red Rock Canyon National Recreation Area, about 15 miles from the strip. Nice views, no hookups or dump station, $15 a night as I remember. The canyon loop drive is very nice. BLM managed. The campground is shortly past the fire station, left turn a mile or so before the loop entrance coming from Vegas. We stayed at Arizona Charlie's on Boulder Highway. 32 bucks for a long concrete paved pull thru. Was pretty decent. Sam's Town on Boulder Highway about 7 miles from the strip is our favorite. Reasonable prices and a nice place. Looked at Sam's Town park a couple weeks ago. Looked like a place I would stay when we take our camper out there. If you are military Nellis AFB has a nice FamCamp. 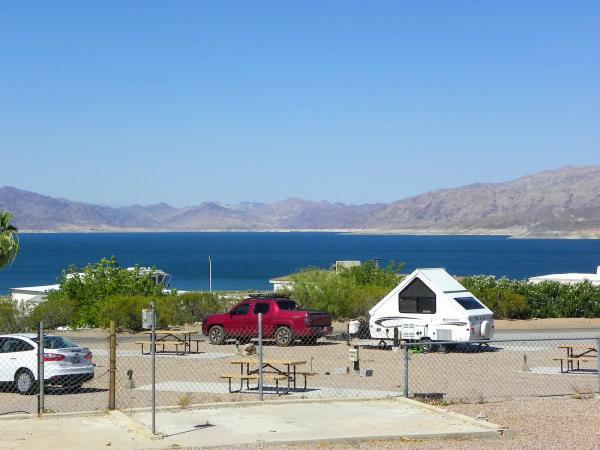 we stayed at Lake Meade, we just needed a place for the camper while we where site seeing. dont recall the prices but the showers and rest rooms where clean. This site is great, has all the best (and not so best) sites that are reviewed by RVers and has links, photos, maps etc. I highly recommend.